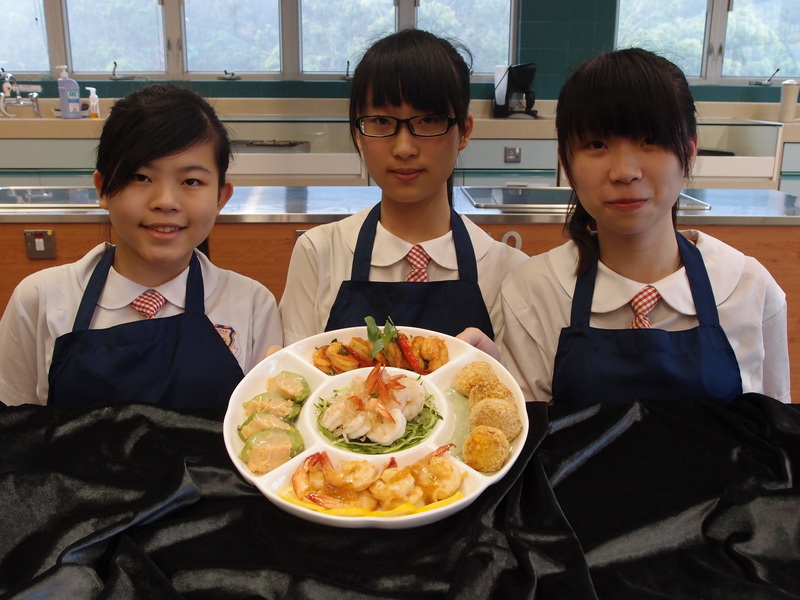 The Annual Cooking Competition themed as “To show your cooking talents and a combination of different flavours in cooking一展廚藝、五味調和” this year, our students (Giann Lai, Sally Sze and Katie Tse) have designed an attractive dish by cooking shrimps through different cooking methods, different flavours and different mix & match ingredients over the world and named as “蝦の五次方”. 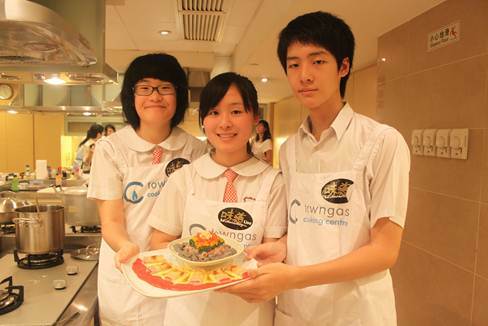 Apart from the use of shrimps, the students have applied the use of molecular gastronomy for making the honey pearls and Airfryer® for deep-frying the shrimp balls in a healthier way. 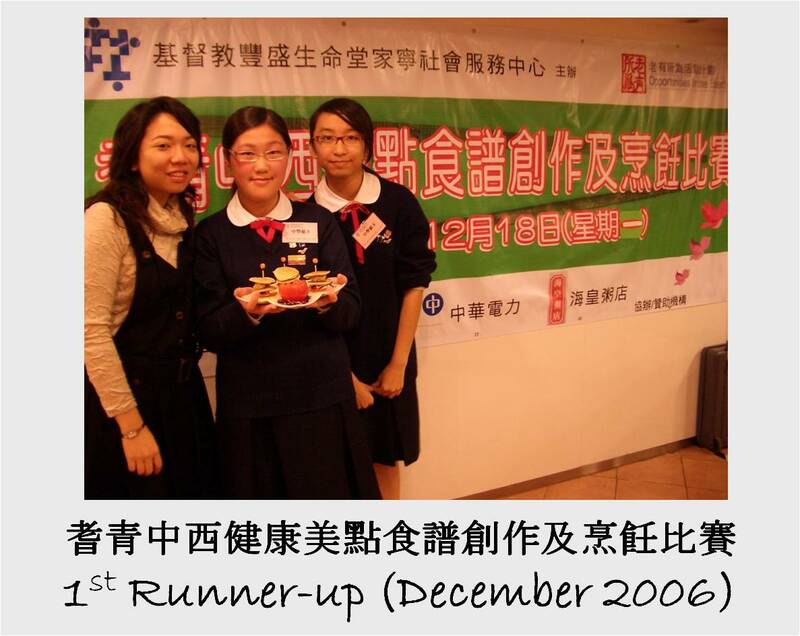 All these skills have been highly appreciated by the judges. 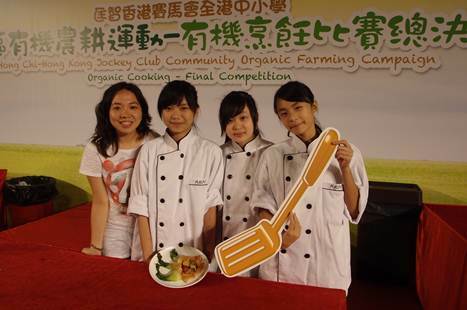 To promote organic cooking, our students (Mikki Cheung, Pinky Liu and Inka Cheung) have joined the competition. They have created a dish called Golden Nest for Colourful Phoenix (彩鳳金盞) by using minced organic chicken to form into balls with different flavours (spinach, curry and preserved fermented beancurd). The chicken balls are then served in a nest made by fried spring roll sheets. 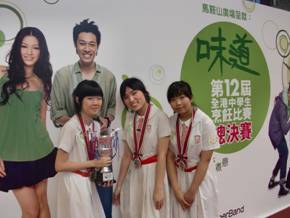 After the competition, students have learnt what organic foods are and they had made good use by combining seasonal ingredients to their dish. 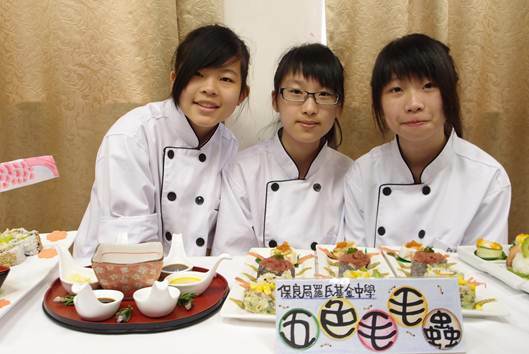 The Annual Cooking Competition themed as “Stylish Cooking, Healthy Eating” this year, our students (Mikki Cheung, Pinky Liu and Inka Cheung) have designed a healthy dish using chicken, brown rice and lots of vegetables. 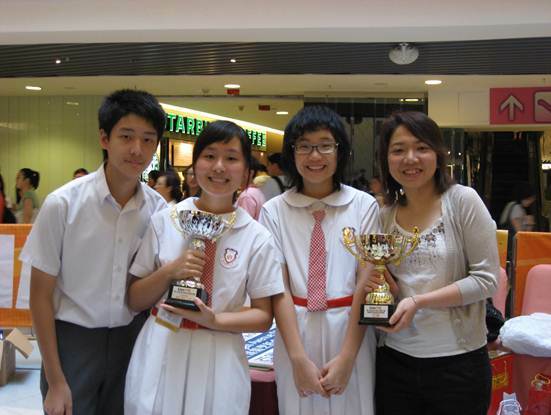 They have been voted by the audience and awarded as the “Most Welcome” team. 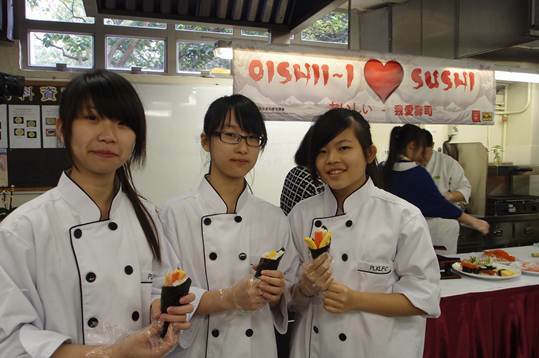 To explore the Japanese sushi, Katie Tse, Giann Lai and Sally Sze have taken part in the cooking competition. 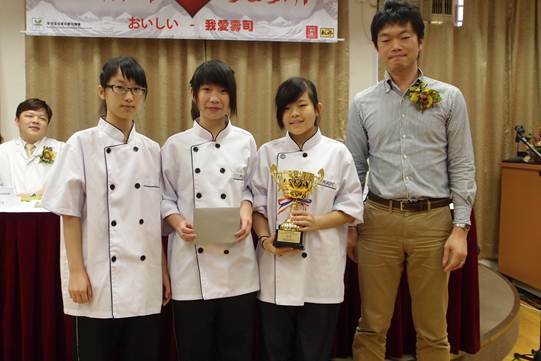 There was a workshop before the competition which was conducted by the chef from Tokoro, The Langham Place Hotel Hong Kong. The chef introduced the history of sushi and demonstrated different types of sushi to the participants. 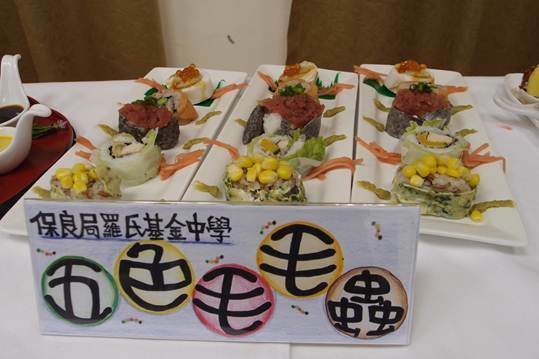 Our students have created a dish of fusion sushi which mixed different Chinese and Western ingredients into sushi. They arranged the sushi like a caterpillar to make it more attractive. 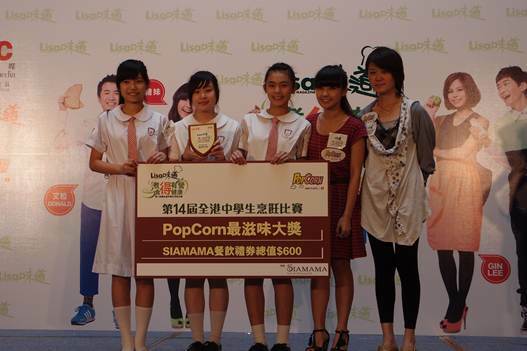 Students were benefited by the comments made from the judges from Watami Japanese Restaurant (和民居食屋). The greenhouse effect and the pollution problems are getting more serious. The ideas in “Green Eating” have been discussed strongly. 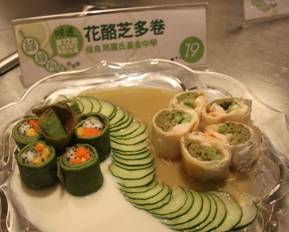 In order to show the concerns to our environment, the organization body, South China Press requested participants to create a GREEN dish. 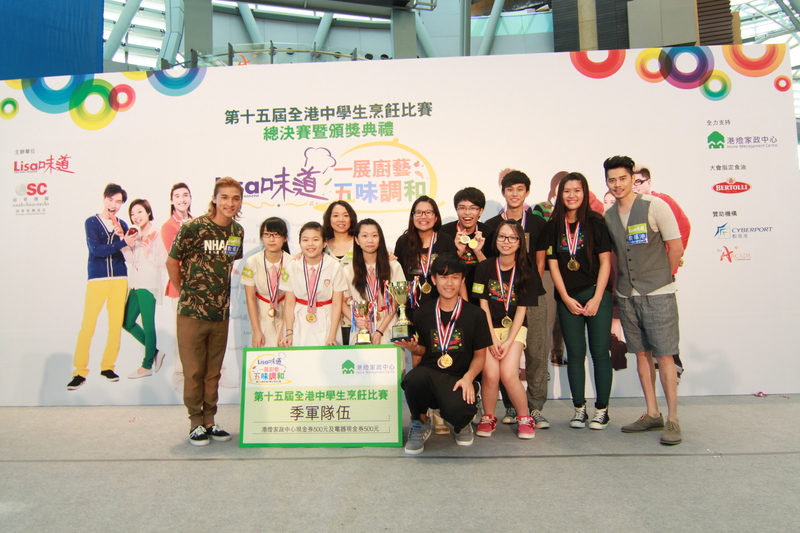 Ting Cheng, Sally Chung and Queenie Lam have participated in the competition. They have spent months in preparing for their dish. They thought of using different types of ingredients which are in green. Besides, they considered using local items which are in season, as the less transportation may lower the emission of carbon dioxide. All these ideas are the concepts of “Green Cooking”. Apart from the color and the choice of ingredients, the nutrition value of the dish is also important. 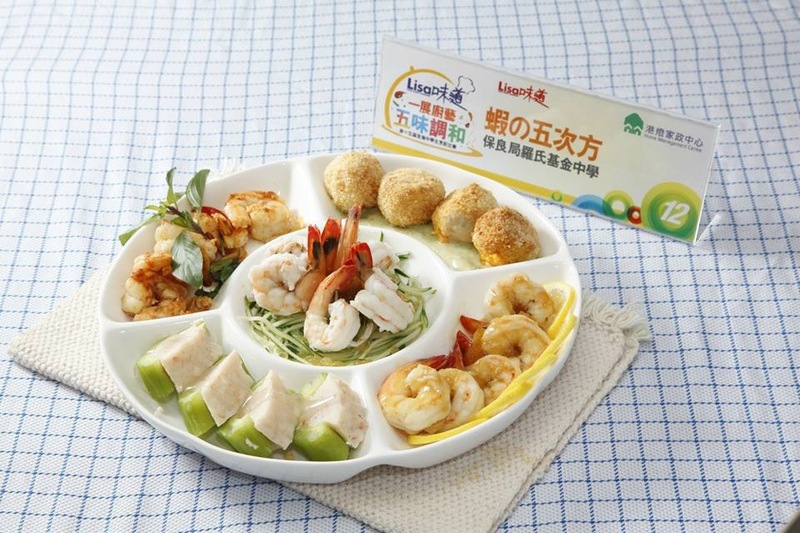 The dish was well-balanced and designed according to the requirements of the food pyramid, including proteins (shrimps, cheese), carbohydrates (green tea noodle), vegetables (long green bean, carrot) and fruits (dragon fruit). They formed rolls by fillo pastry and green tea crepe. As there are two different types of rolls, one is hot and served with broccoli sauce while the other is cold and served with yoghurt, so they arranged the rolls on the plate like the Tai Chi logo. 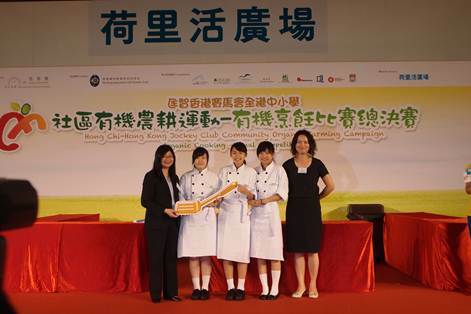 Our talented chefs Nicky Muk, Miu Wong and Karen Leung joined the culinary competition again. They had shown the innovative idea of a “two-in-one dish”. The visually appetizing dish was not only feasted the judges and guests, but also captured the essence of quality food and good health. 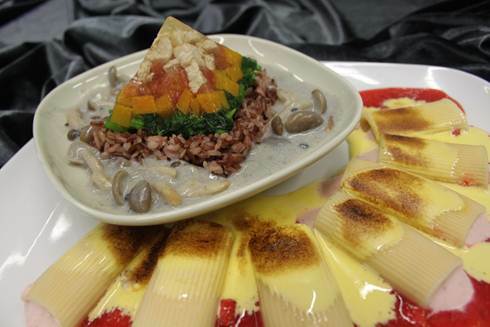 The main dish is shaped like a food pyramid revealing the importance of a balanced diet. The ingredients from the bottom to the top include creamed mushrooms and black sesame, tender and juicy chicken and a combination of spinach, pumpkin and tomatoes. The colours also represented the five elements including red, black, green, yellow and white. Around the pyramids is a dessert in disguise. The strawberry mousse pasta topped with the sweet taste of sabayon might look like rolls of meat. 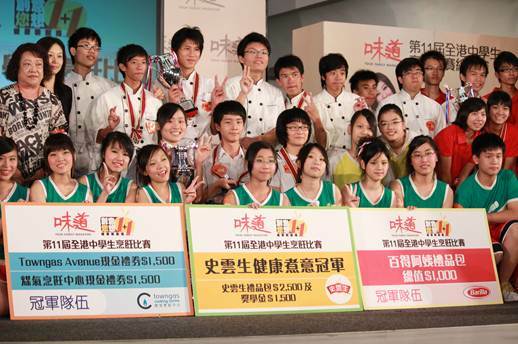 As it is the Beijing Olympic during this summer, the theme of the cooking competition is also focus on this big event. 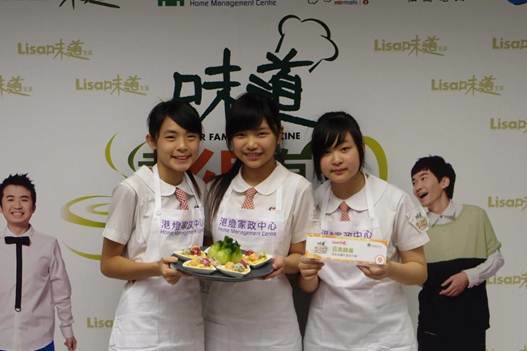 The team of students (Nicky Muk, Miu Wong and Karen Leung) has designed a pasta pastry for their dish to the competition. 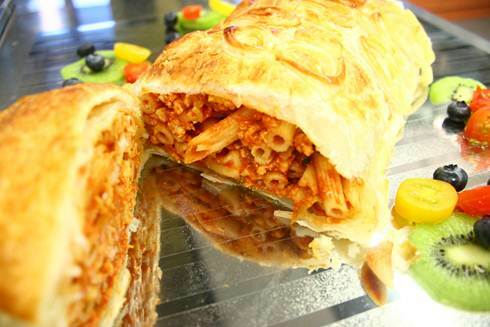 The meaty pasta rolled in the puff pastry and topped with some meringue (beaten egg white) which looks like the Olympic Torch. 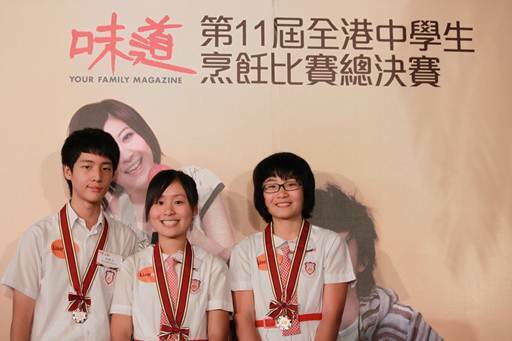 The limited cooking time and cooking outdoors challenged the team much but luckily they have overcome the difficulties. In order to show the love and cares to the elderlies, Angle Lam and Winnie Leung have designed a pancake snack with herby chicken and colourful vegetables. They skewered the pancakes and served like mini burgers to help eating easily. 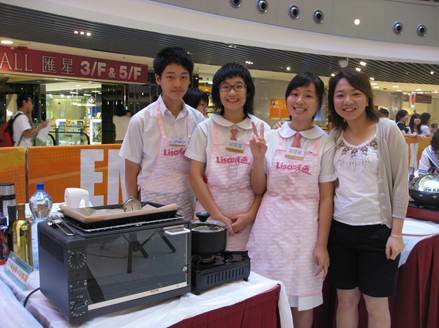 Through the competition, they have learnt how to take care of the old people by serving them some healthy and attractive food to raise their appetite.